Panda_Destroy Convention Wrap-Up: COMIKAZE 2013! WHOO! Sorry for the late update, guys. To sum up this weekend’s Comikaze 2013 in one word would be most difficult, but I’m going to try anyway. Ready? Here we go. This year’s Comikaze was EPIC! And fun, too! HA! Told you it would be too hard to sum it up with a single word. Nonetheless, it was a sight to see all the actors and attendees enjoying themselves while walking through the exhibit hall without any SERIOUS TRAFFIC. Yes, I said it. You could’ve actually WALKED through the exhibit hall comfortably, which is an awesome thing compared to other big comic book conventions out there. So, what did we enjoy about Stan Lee’s Comikaze 2013? Let me tell ya! Comikaze has come a long way. It started out in the lower parking garage of the LA Convention Center and moved it’s way on up to the main exhibit hall. This year, the convention had an increase in vendors, exhibitors, and artists. The atmosphere wasn’t as overwhelming as with other big comic conventions either. Despite the increase of booths and attendees, there was still enough walking room on the show floor for people to comfortably get where they needed to be with easy access to aisles which increased the ease of navigation. Now, you may be thinking to yourself “Why is he telling me this? Why do I need to know this?” You need to know this because this was one of the main reasons I enjoyed Comikaze. No walking in crowded aisles and moving inch by inch in a crowd that would bring about the feeling of claustrophobia. Comikaze brought about a memorable experience that I enjoyed without the hectic crowds, and because of this, I will surely return next year! 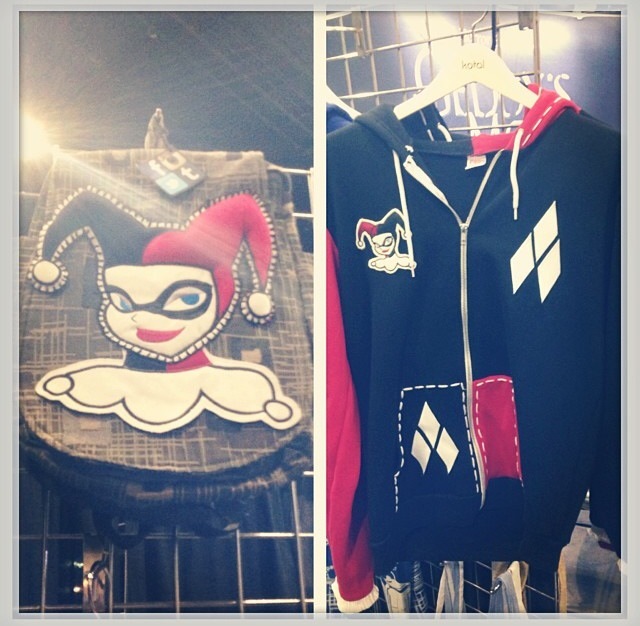 The exhibitors and vendors were more than I expected this year and the con had a wide variety of items to purchase aside from the usual video game/anime/comic book clothing and accessories, such as those made of hemp material (as pictured above with the Harley Quinn bag and hoodie from the GeekyU which was made with hemp). 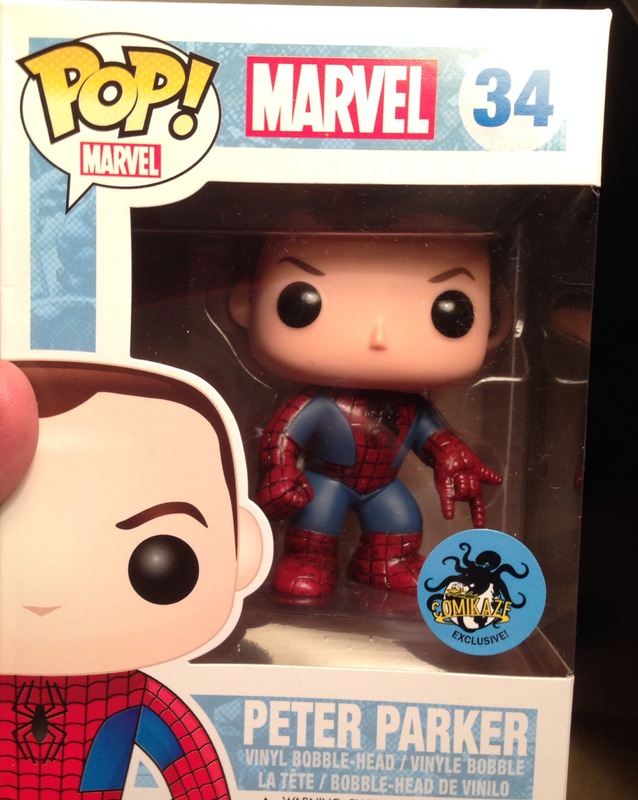 Comikaze also had big name exhibitors and vendors, such as I Love Boobies, NEFF, and Hot Topic, which came as a surprise to me (maybe not Hot Topic, but the other 2…YES) with Hot Topic selling a few Comikaze exclusives, such as the Peter Parker POP! Figure that I, myself, got my hands on (as seen below). As for the guest list? LEGENDARY. What set Comikaze apart from the other conventions was that there was a Hot Topic Main Stage placed at the back of the exhibit hall. Now, I know what you’re thinking…FIRE HAZARD! Well, nothing to worry about, children. It was located near the fire exits (and 2 gigantic garage doors, might I add) to provide safety. 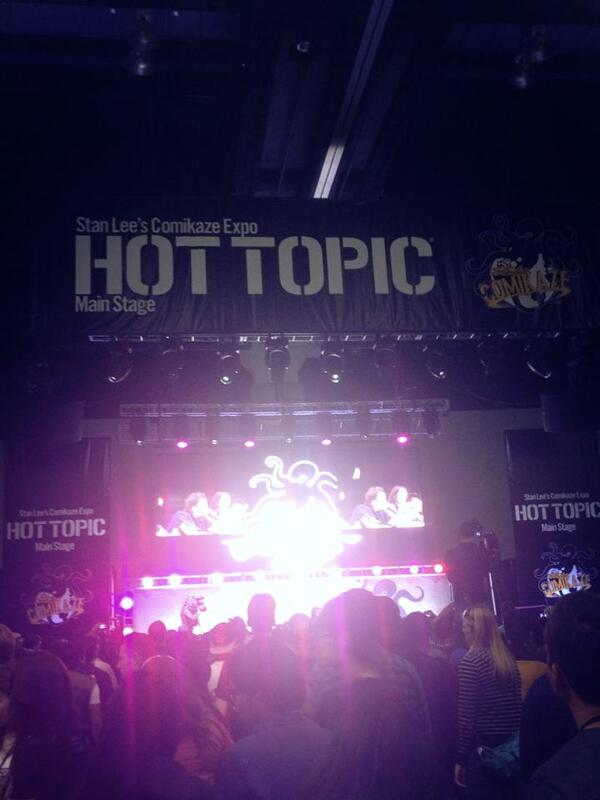 The Hot Topic main stage was an addition I thought brought the most out of Comikaze. The main panels took place on this stage, which eliminated the need to stand in line for hours or even attend a panel you have no interest in just to attend the panel you wanted right after. This addition of the main stage made it so that everyone in the exhibit hall could see and hear what the panels were about even without having to stand in front of the stage (1 large screen placed in the middle for all to see. You can see the picture of the stage above). So, there you have it. A quick wrap-up of Stan Lee’s Comikaze 2013! Check out more of our pictures on our Flickr and Instagram if you haven’t done so already! The links will be placed below. See you guys at the next comic convention….which is LONG BEACH HORROR AND COMIC CONVENTION on NOVEMBER 23 AND 24! To view more photos and see our experience at Comikaze as well as future conventions, catch us on Flickr: http://www.flickr.com/photos/panda_destroy/ and follow us on Instagram: http://instagram.com/panda_destroy! Thanks, guys! PandaDestroy.Com will be at Long Beach Comic Expo Feb.28th – Mar. 1st! Panda Trailers: CHAPPIE (2015) Trailer #2! Panda Review: Tokyo Ghoul Season 2 Premiere!